Whether within or without the industry, most can agree on the importance of education and giving children all of the tools they need to be successful, especially as the world and workforce around us changes so drastically and consistently. Financing those tools is a completely different matter altogether. The number of special needs and learning disabled students is steadily increasing, and one in five children entering the schooling system don’t speak English as their first language. These pains require funds to solve properly, and it doesn’t help that many Americans are unaware of where their tax dollars are spent. Our guest today explains that though many constituents are under the impression that when taxes increase so do the funds to the schools, that’s just not the case. On today’s EdTech Podcast, we sat down with Katie Bowman, CPA, the Associate Superintendent for Finance and Auxiliary Services for Birdville ISD in Texas. Bowman covers a variety of departments, including purchases, facilities, construction, child nutrition, and transportation; it is easy to see how it can become difficult, especially when “school finance itself is very complicated,” Bowman said. “All of my staff have seen that we’re in a really good place with the Cenergistic team,” Bowman said, who notes that having Cenergistic employees visit her school system has helped tremendously in adding manpower to her team. She points out that they started out by auditing what lights and energy were being used after hours, and found ways to save energy, like changing the preset temperature by one degree. The company has re-empowered the district with not only additional funds, but also freed up the Birdville staff to do other things, like preventative maintenance. 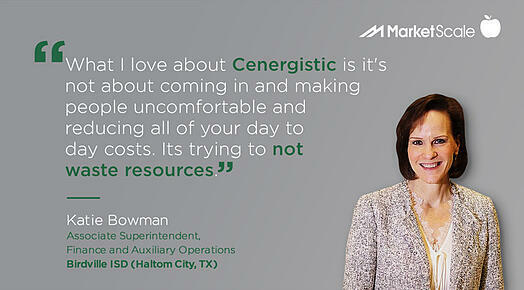 Contact Cenergistic to find out how we can help you take back dollars with energy conservation programs!